I haven't had a chance to write ever since we got to Argentina. We've been too busy looking at one of the world's wonders, the Iguazu Falls, from every possible angle. The highlight was a helicopter ride -- Andre's first, my second. About 12 years ago, my German family (I lived with them as a summer exchange student in 1974) treated me to a ride over the Grand Canyon with them. So it was my turn to treat someone. Andre was so thrilled, which made it worth the price. I paid $150 -- as much as my friends Antonia and Nena, tourist police in Santo Domingo, earn in a whole month -- for a 15-minute ride, but definitely an unforgettable experience. 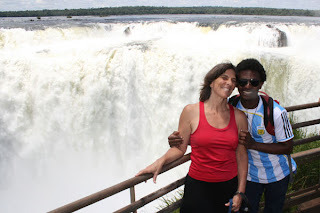 We spent two full days on the Argentine, hiking all over, up and day and around, and a few hours on the Brazilian side, mostly getting the overall view of how enormous they are. I sprinkled some of Maya's ashes into the falls.. We took an eco raft trip and the famous boat ride under the falls. Just in the last year or two they started providing water-tight bags to put your cameras and other things into because when you get completely drenched. Luckily it was a hot sunny day and we dried quickly. We also enjoyed seeing lots of coaties, something like a raccoon, and 2-foot long iguanas. 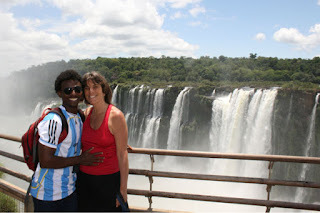 Like the guidebook says, Iguazu Falls is wider than Victoria, higher than Niagara, and more beautiful than both. There are 275 cascades in all, making it the world's largest. Not far away is the world's largest dam, Itaipu, which we saw today. 17 years in the making, it was a bi-national billions of dollar project between Paraguay and Brazil. This one hydroelectric plant supplies all the power to 95% of homes in Paraguay and 25% of the homes in Brazil. The facts and figures were impressive, but looking at it was nowhere near as awesome as the falls. We took so many photos and video I haven't had time to organize and edit yet, so I'll just attach a few now and do more later. We're staying in a great little youth hostel called Peter Pan for $20 a night for a private room, really clean and nice, great movies on the TV in English with Spanish subtitles, breakfast and a pool. We've made friends with folks from Belgium, England, Germany, Argentina, Sweden, and France. A couple of people are even older than me! It's such a relief to be in a more affordable country. Andre had a huge 400 gram steak with a heap of mashed potatoes for $7. I'm enjoying the meat and veggie empanadas, only 50 cents each. We've been leaving 25% tips ($3) and feeling very generous. Tomorrow we take a 17-hour bus ride to Buenos Aires. We splurged and got the seats that go completely flat. I'm pretty sure I can sleep like that. I barely dozed off on our last night bus from Curitiba, Brazil. You think you're saving time and money by sleeping on the bus, but since I usually can't sleep on the bus I end up feeling lousy when we get to our destination and Andre crashes out got most of the day. I'm not a napper. Whenever the sun is up, so am I. Speaking of which, I should get some sleep tonight since tomorrow we travel. Andre has a childhood friend living in Buenos Aires who he's anxious to see. He hasn't spoken Creole except in quick phone conversations with bad connections in the past 3 weeks. By the way, all of his family and friends survived the recent cyclones in Dominican Republic and Haiti. I'm going to hook up with a friend of a friend who arrived in Buenos Aires a few days ago and will stay a month, studying Spanish. Maybe Andre and I could even separate for a few days and actually miss each other for a change. This 24/7 stuff is not always easy.